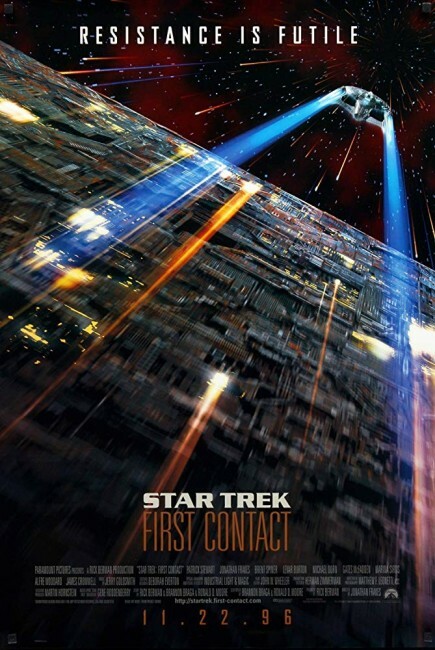 Director – Jonathan Frakes, Screenplay – Brannon Braga & Ronald D. Moore, Story – Brannon Braga, Ronald D. Moore & Rick Berman, Producer – Rick Berman, Photography – Matthew F. Leonetti, Music – Jerry Goldsmith, Visual Effects Supervisor – John Knoll, Visual Effects/Animation – Industrial Light and Magic, Special Effects Supervisor – Terry D. Frazee, Makeup Designer – Michael Westmore, Production Design – Herman Zimmerman. Production Company – Paramount. The new Enterprise is on its rundown mission as Earth is attacked by The Borg, a cyborg gestalt that assimilates all other cultures into its collective. Captain Picard disobeys orders and takes The Enterprise back to Earth to join the fight. They arrive just as The Borg send a ship back into the past. Captain Picard decides to follow them. They arrive back in the year 2063, the day before inventor Zefram Cochrane perfects the warp drive and launches the first warp-capable ship. They realize that The Borg are attempting to stop the formation of The Federation. They succeed in destroying The Borg ship – only for The Borg to beam aboard and start assimilating sections of The Enterprise. 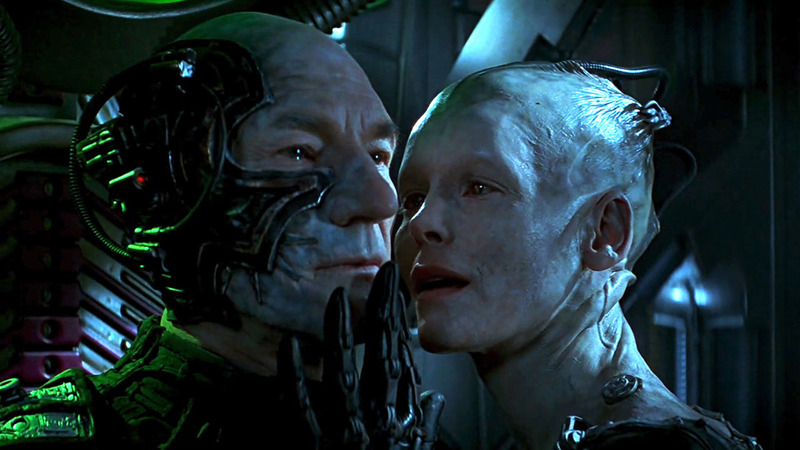 As Picard fights a desperate pitched battle against the enemy that once assimilated him into its midst, the Borg Queen tries to seduce the android Data into surrendering the encryption codes that will allow her to take over the ship. Everyone agrees that Star Trek: Generations (1994), Star Trek: The Next Generation‘s maiden cinematic voyage, was a major disappointment. Not that the creative team involved didn’t have it in them, as many episodes of Star Trek: The Next Generation (1987-94) can be counted among the best televised science-fiction of the 1990s. Following Generations, the Star Trek team put their losses behind them and embarked upon this second outing, which was greeted was an altogether more positive response. The problem with the Classic Star Trek films became the point that they started allowing the original Star Trek cast to rise above their level of competence and to become involved in the creative end of things, beginning with Leonard Nimoy’s assumption of the directorial chair with Star Trek III: The Search for Spock (1984). The classic films soon ended up caught in a puerile loop of nostalgia that pandered to the imagined interest of the fans – each cast member would come on to do a broad comic set-piece, while the characters were never allowed to advance in rank despite their increasingly obvious age. The sad and ugly truth about the Classic Star Trek films is that the egos of the stars had become confused with the creative vision. None of them wanted their characters to do less glamorous and realistic things like retiring or taking desk jobs, while the supporting characters were still opening hailing frequencies at the age of 50 when they should be promoted to command positions. A similar sense of sinking expectation came here with the news that Jonathan Frakes, who played the second-in-command Will Riker in Star Trek: The Next Generation, was making his big screen directorial debut. (Frakes had made his debut as director in Star Trek: The Next Generation‘s its third season). Despite worries of similar disastrous creative interference happening once the Next Generation cast got their hands on the films, Frakes holds his end up well. The creative control has wisely been still left in the hands of the producing and writing team behind the various new tv series. All of the regular cast from the tv series are present but remain amazingly subject to greater things like plot and story. In fact, most of the cast from the series, apart from Patrick Stewart and Brent Spiner, have amazingly low-key roles in Star Trek: First Contact. It is hard to imagine any of the cast members in a Classic Star Trek film doing the same. Star Trek: First Contact is mounted as an action film. Jonathan Frakes proves especially good when it comes to directing effects. The film contains arguably some of the best effects sequences of any Star Trek film (although Star Trek – The Motion Picture (1979) still gives stiff competition). The new Enterprise looks stunning both inside and outside – this is one of the first times that one gets a real feeling for its immensity. The space war sequences are breathtaking. Frakes fills the film with wondrous throwaway touches that make one go ‘ahhh’ in delight – like the opening shot that keeps pulling back from a closeup of Picard’s eyeball until it encompass an entire Borg hive; or the moment when we see the crew walking upside down along the hull of The Enterprise (surely the only post-Star Wars (1977) science-fiction film that dispatches with up-is-up centrism in space). Jerry Goldsmith also delivers an excellent score. The film comes with cute in-jokes for the fans – reference to Data being ‘fully functional and programmed in multiple techniques’ (the cult seduction scene from the The Naked Now (1987) episode), an appearance from Dwight Schultz’s super-nerd Ensign Barclay, a return visit to Picard’s film noir holodeck program from The Big Goodbye (1987) and an hilarious cameo appearance by Robert Picardo in his emergency holographic doctor program role from Star Trek: Voyager (1995-2001). (The inclusion of the character of Zefram Cochrane also ties in with the second-season Classic Star Trek episode Metamorphosis (1967), although it is hard to believe that James Cromwell’s irascible characterisation here would mature into the same person that Glenn Corbett played in the original). Unlike the Classic Star Trek films, these throwaway fan touches are never allowed to overtake or indeed become the entire film. Star Trek: First Contact is not without its quibbles. It moves excitingly, although the constant cutting between the multiple storylines slows it down – the fifteen minute climactic countdown seems a lot longer than fifteen minutes. One doesn’t understand why everybody wastes their time with continually adapting phaser wavelengths to shoot The Borg if Picard can shoot a Borg with a tommy-gun (and a holographic one at that) – why do not they just replicate a batch of machine-guns and/or armour-piercing bullets? The forcefield window seems a stupid thing to have on a ship – people everywhere must live in absolute fear of a power cut. And then there is the Borg Queen. The Borg are arguably the best alien creations of the various new Star Trek series’ – a cyborg species that lives as a collective consciousness, ruthlessly and near-invincibly assimilating and absorbing every technology it comes across. Their second appearance in the two-parter The Best of Both Worlds (1989-90) is one of the finest two or three stories to come out of Star Trek: The Next Generation – indeed, The Best of Both Worlds should have been the first cinematic outing. Having created such an imposing enemy, the series seemed at a loss to know what to keep doing with The Borg and their subsequent appearances fell into weak and mawkish sentimentality as they were gradually introduced to emotion. The film welcomely restores The Borg to their original menacing nature but The Borg Queen idea is a miscalculation. The film sort of justifies the idea but the way it is played (even though Alice Krige does a fine job relishing in the lasciviousness of the part) goes badly against the idea of a collective consciousness. What the film needed was a scene that pulls back to show that the Queen was only using seduction as a means of getting the information she wanted from Data and that she feels none of it. The major fault with the film is the plot. The problem with Star Trek: Generations was that it felt like a tv episode that had somehow wandered onto the big screen. Star Trek: First Contact‘s problem is exactly to the opposite – it is filmed for the big screen but makes the regrettable mistake of too many recent big-budget science-fiction spectaculars. And that is that spectacle comes first – the plot is conducted in terms of a series of flourishes of effects set-pieces and at times only seems to exist to connect effects set-pieces together. The thinness of the plot becomes apparent at times – the business with the antenna is merely a device in order to conduct a battle in spacesuits; the detour into the Dixon Hill holodeck program in the middle of a chase sequence is too obviously there as just a fan pleaser; Michael Dorn’s Worf became a regular on tv’s Star Trek: Deep Space Nine (1992-9) following Star Trek: The Next Generation and the film goes out of its way to contrive to bring him back together to complete the cast ensemble. Still, Star Trek: First Contact is not a bad try though. The other Star Trek: The Next Generation films are:– Star Trek: Generations (1994), Star Trek: Insurrection (1998) and Star Trek: Nemesis (2002). The other Classic Star Trek films are: Star Trek – The Motion Picture (1979), Star Trek II: The Wrath of Khan (1982), Star Trek III: The Search for Spock (1984), The Voyage Home: Star Trek IV (1986), Star Trek V: The Final Frontier (1989) and Star Trek VI: The Undiscovered Country (1991). Star Trek (2009), Star Trek: Into Darkness (2013) and Star Trek: Beyond (2016) were reboots of the classic series, which recast the classic roles with new faces. The Star Trek tv series are Star Trek (1966-9), Star Trek: The Next Generation (1987-94), Star Trek: Deep Space Nine (1992-9), Star Trek: Voyager (1995-2001), Enterprise (2001-5) and Star Trek: Discovery (2017– ). Jonathan Frakes directed the next series entry Insurrection and then went onto the children’s time-travel film Clockstoppers (2002) and the big screen remake of tv’s Thunderbirds (2004). With the disastrous flop of the latter, Frakes has since returned to directing in tv with the adventure films The Librarian: Return to King Solomon’s Mines (2004) and The Librarian: The Curse of the Judas Chalice (2008), along with a great many episodes of various series. Frakes has also produced the teen alien tv series Roswell (2000-2) and the tv series of The Librarians (2014– ). (Winner in this site’s Top 10 Films of 1996 list. Winner for Best Musical Score, Nominee for Best Supporting Actress (Alice Krige), Best Special Effects and Best Production Design at this site’s Best of 1996 Awards).